Note that we no longer think of those computers serving up the files as "servers". Rather, they're your peers - other computers pretty much just like yours. Hence the term "peer-to-peer". "The problem is not with the technology, but with how it's frequently used." 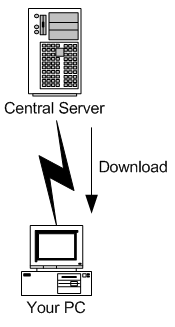 By copying peer-to-peer the bandwidth used is spread out across many different paths through the internet. Peer #1 might be down the street, peer #2 might be across the country, and peer #3 might be across the planet. Each will serve up parts of the file as fast as they can, and your BitTorrent client patches those pieces together as they arrive. Now, how did those peers all get the file in the first place? The same way you're downloading it. And how did they start serving up pieces of the file? By running the BitTorrent client. One important aspect of peer-to-peer file sharing is that as soon as you've downloaded even a piece of a file, your file sharing client can then make that piece available for someone else to download from you. 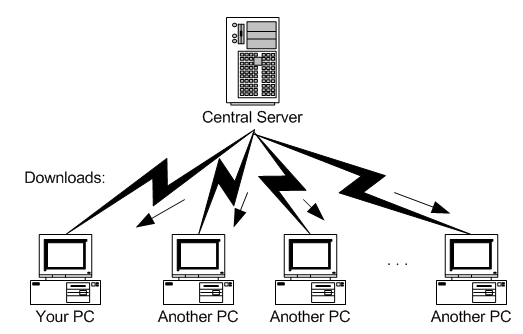 Your computer becomes one of the peers that can serve the file to others. 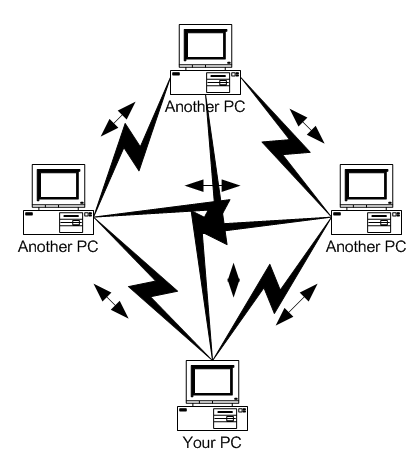 In this diagram every computer interested in sharing or downloading a particular file is, effectively, connected to every other interested in that same file, sometimes called a "swarm". If a computer doesn't have all the parts of the file, it keeps asking other peers for the missing pieces until it has the complete copy. It can then remain in the swarm, making all the pieces available to any other peers that ask. So that, in a nutshell, is BitTorrent, and peer-to-peer file sharing. In and of itself, it's just a different technology to download files, and there's absolutely nothing inherently wrong with that. BitTorrent itself will not harm your computer in any way. The problem is not with the technology, but with how it's frequently used. As you can see from that last diagram, there is no single authoritative site for a particular file being shared on a peer-to-peer network. 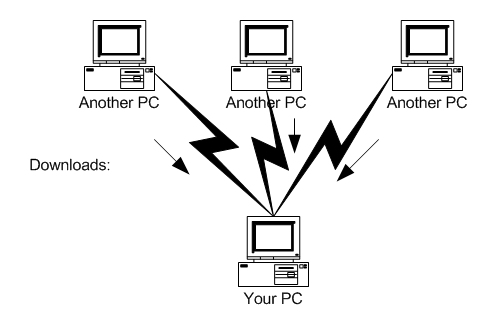 If you take out any one of the computers in the network, the rest can continue to share and copy the files quite happily. That means it's extremely difficult to stop a file from being shared. It also means that it's very difficult to track down all the sites sharing a file. In turn, that means that sharing illegal or pirated copies of files is much, much easier, because it's much less likely that any single sharer will be tracked down and prosecuted. Possible? Yes. But definitely more difficult. So, many peer-to-peer networks have a lot of illegal content. Even so, downloading illegal copies of legitimate software, music or videos won't harm your computer. It's wrong, but it won't harm you. Spyware and viruses, on the other hand, will. What many hackers and malware creators have realized is that there are a lot of people downloading illegal software from peer-to-peer networks. Since there's almost no accountability for what gets placed on a peer-to-peer network, it's trivial for them to put up lucrative files that have been infested with malware. For example a file sharing network might offer "Microsoft Office", and it might even be a copy of the latest and greatest copy of Office. 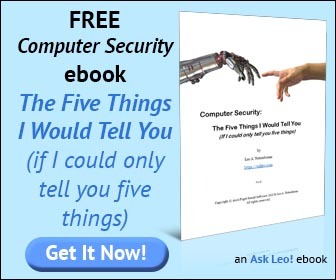 But it's quite possible, perhaps even likely, that the person that first shared that copy added to it spyware or viruses in the hopes that people would be tempted by a free copy of an expensive product only to install much more than they bargained for. And that's what will harm your computer - the malware that often accompanies "free" software available on peer-to-peer networks. Because, let's face it, who would you complain to if you find that your latest free download infected your machine with spyware? As I said, there's no accountability, and nowhere to turn. Besides the moral and ethical reasons for not downloading illegal software, the risk of infection is a very practical reason to stay legit. If the receiving computer has a current and active firewall, antivirus, antispyware, etc. is the risk of becoming infected greater because more pieces have to be scanned? How does this compare to scanning an entire file from a single source? I would consider it roughly equivalent. It depends somewhat on the anti-virus program's architecture and configuration. There's a theoretical hole if a virus spans two different pieces that are downloaded separately. It's a low probability to begin with, and some virus scanners may handle it anyway. Anti-spyware scans typically kick in when (or after) you've actually run the downloaded file, so that's after the download's done regardless of how you got the file. Firewall doesn't actually apply in this situation. The viruses/spyware myth is perpetuated by organisations who want to control what you can and can't do with your pc and everything on it. then any potential harm is minimised. In 10 years of downloading everything from p2p, I have had less than 5 viruses and 25 spyware. All of them detected and removed automatically within seconds my software before anything happens. The trick is not to be stupid, read other peoples comments where possible to avoid downloading something already flagged as bad. no it wont harm because the only way to get a virus us for the contents downloaded from the torrent to be packed with a virus. torrents are not like gnutella,napster or limewire where you share directly. a torrent you have to pack the files and assign a hash to the files . Can the usage of linux(ubuntu) while downloading from torrents, reduce the risk of getting virus,spywares etc?? I'm terrible with technology. I've never bit-torrented anything before, but I'm curious. If I bittorrent virus-corrupted files onto one computer, then transfer those files to another computer via flash drive, would that corrupt the second computer with the virus? It depends on a number of things, but yes, in short, it's possible. Avoid viruses, period. I used both Bit Torrent and Limewire for a little over 2 years but will never use them again. I was hit with a Trojan virus that cost me $218! Never again! While I don't recommend sharing/downloading pirated software, P2P file sharing is a great way to find obscure music & even old TV shows. I've been using utorrent for a while & have never downloaded a virus. Like Peter A. states above, If you read the comments & ratings from people who have already downloaded the file you want, you should have no issues. I also use Avast antivirus & Malwarebites Antimalware. Or any other distro of linux. viruses and legitimate issues are one story, but lately i learnt another stark truth about torrents that it shortens the life span of ur hard disk. But still it is an undisputed issue. Bogus. Torrents don't shorten your disks life. Gotta tell you that this is the first time that I have read an explanation for a computer question that I can actually understand. The words as well as the diagrams were very well put together and I do appreciate this. You see, I am the quintessential computer moron. Thank you very much for your clear, easy to understand explanation. Happy Holidays. Leo, in your opinion, is WebRoot SecureAnywhere or similar virus detection software an acceptable defense against torrent-triggered malware? Torrent triggered malware is no different than any other kind of malware which you can get from running a virus infected program. These kinds of virus are 100% preventable if you don't run any programs or download files which are not from reputable sources. If I'm using bit torrent to just watch movies and t.v. shows, and I have Kaspersky will I still be at risk for catching viruses? Note: I'm not using it to download software. If you don't download programs, using BitTorrent would not put you in danger of catching a virus. However, if you use it to download copyrighted materials, you would be at risk of getting caught and paying a heavy fine. It happened to a friend's daughter.